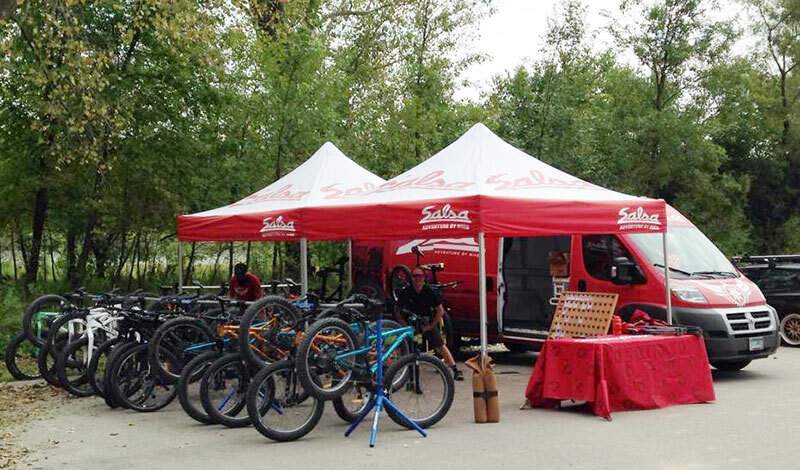 The good people from Salsa Bikes wil bring out their trailer full of toys to Double Lake. What should you expect at a Salsa Demo Day event? The Facebook listing generally lists the bikes that we intend to have at the demo. Occasionally we link a camping or bikepacking experience to the event as well, and when that happens we call it out in the posting as well. Wear or bring your riding gear with you. We do have some loaner pedals if needed. It is important to bring your drivers license and a credit card. While at the demo, I’d suggest taking the opportunity to ride as many of our models as you can. Our crew will take the time to set you up properly and get you riding. Proper setup is something that we take great pride in. Speaking of our crew, odds are good that you will be taken care of by one of our Sales Brand Ambassadors at the demo. These hardworking guys each take our demo truck out around the country and run the show at each event.